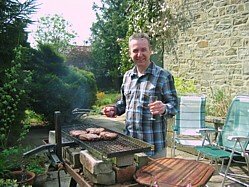 Hi, I'm Paul the Barbecue Smoker Recipe Man behind this site. On this page you'll find all the information you need to contact me together with the legal stuff that will (hopefully) let you rest assured that I am human and not a front to some faceless corporate entity. If you've got a question for me click here. It has crossed my mind that maybe I just like lighting fires but really I am a serious barbecue enthusiast. In fact the whole outdoor cooking experience is for me! I remember my father buying our first barbecue in France one year when on a family camping holiday, a Frenchman camping next to us showed us how to light it and the rest (as they say) is history. Now with my own family I love camping in Europe and hopefully getting new inspirations and barbecue ideas, I've even done the odd winter holiday (at least most of my friends thought that was odd) and there's nothing to beat a good barbecue at the end of a hard days skiing. Enthusiast or mad? Make your own mind up! I cook professionally on my barbecues and meet lots of great people along the way. I make barbecues and replacement parts. My philosophy is simple, I make products that I regard as good quality and ones that I would cook on myself. Everything is bespoke and handmade in the UK so we're not cheap but our products are designed to last a lifetime. 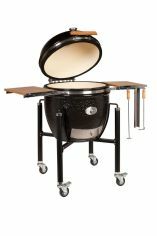 Links from this website to other on-line merchant sites such as (but not exclusively) Amazon and BBQGuys.com provide you with the opportunity to purchase items from these sites. If you choose to buy then I receive a small commission on these purchases which contributes a little towards the running of this site and I thank you heartily for your support. Your purchase of Que Fresco products is my reward for the massive investment in time taken to build this website and I really do thank you for your support. I only build and supply Goods that I know work and are built to the standards one would normally expect of a quality product. Inevitably there has to be a legal framework to your purchase so here I explain the Terms and Conditions on which we supply any of the products (Goods) available for purchase here on barbecue-smoker-recipes.com. Please read these terms and conditions carefully and make sure that you understand them before ordering any Goods from my site. By ordering any of our Goods, you agree to be bound by these terms and conditions. Please print a copy of these terms and conditions for future reference. After placing an order, we will confirm by email that we have received your order and provide you with an approximate delivery date. Closer to the approximate delivery date we will contact you again to confirm the actual delivery date. The delivery driver will unload the vehicle and deposit the Goods at the entrance to your property. The delivery driver has no responsibility to transport the Goods from the vehicle over uneven, sloping, shingled or graveled surfaces. The delivery driver has no responsibility to unpack or assemble the Goods. Que Fresco Ltd or its appointed carrier are not responsible for the disposal of the pallet or any packaging surrounding the Goods. By signing the proof of delivery provided by the delivery driver without noting any fault or damage, you acknowledge that you have inspected the Goods and that they do not show any signs of fault or damage. Payment for all Goods must be either by BACS transfer or by credit or debit card. Title of Goods passes to you when full payment has been made for the Products together with delivery charges. Responsibility for the due care of the Goods passes to you when you sign the proof of delivery provided by the delivery driver. Any orders shipped outside of the UK will be done so under DDU incoterms. Goods may be subject to import duties and taxes which are levied when the delivery reaches the specified destination. You will be responsible for payment of any such import duties and taxes. All of our Goods are made to order. If you wish to cancel an order then call us immediately on 07814 500755 so that we can stop work. An assessment will then be done to establish the direct costs to us and we then reserve the right to charge for the work already undertaken. Goods should be returned to us in a good clean sale-able condition and in their original packaging. If the returned Goods have not been looked after by you with reasonable care and are not in the condition that they were in when delivered to you, we reserve the right to counter claim against your refund. Should you wish to return the Goods because you consider that the Goods are defective we will examine the returned Goods and will notify you whether you are entitled to a refund via e-mail within a reasonable period of time. We endeavour to process any refund due within 30 days of the day we confirmed to you via e-mail that you were entitled to a refund. We will refund the price of a defective Goods in full, any applicable delivery charges and any reasonable costs you incur in returning the item to us. If you purchased using a credit card we will not refund the credit card charges we have incurred to process your payment. Should the Goods prove to be defective we shall only be liable to you for the purchase price of the Goods. We will not be held responsible for consequential loss. The majority of our communication to you will be either through this site or by email. By placing your order with us you accept this method of communication as being normal. This condition does not affect your statutory rights. All notices given by you to us must be given to info@quefresco.co.uk or to our registered office (see Definitions). We may at some point in the future transfer our rights under these Terms And Conditions to another organisation but this will not affect your rights or our obligations under this Contract. If we fail, at any time during the term of a Contract, to insist upon strict performance of any of your obligations under the Contract or any of these Terms And Conditions, or if we fail to exercise any of the rights or remedies to which we are entitled under the Contract, this will not constitute a waiver of such rights or remedies and will not relieve you from compliance with such obligations. A waiver by us of any default will not constitute a waiver of any subsequent default. No waiver by us of any of these terms and conditions will be effective unless it is expressly stated to be a waiver and is communicated to you in writing in accordance with clause "Notices and Communications"
The Terms And Conditions and any document expressly referred to herein constitute the whole agreement between us and supersede all previous discussions, correspondence, negotiations, previous arrangement, understanding or agreement between us relating to the subject matter of any Contract. We each acknowledge that, in entering into a Contract, neither of us relies on, or will have any remedies in respect of, any representation or warranty (whether made innocently or negligently) that is not set out in these terms and conditions or the documents referred to herein. We both agree that our only liability in respect of those representations and warranties that are set out in this agreement (whether made innocently or negligently) will be for breach of contract. Nothing in this clause limits or excludes any liability for fraud. The Terms And Conditions herein will be governed by English law. Any dispute or claim arising these legal terms will be subject to the non-exclusive jurisdiction of the courts of England and Wales. Is this page providing you with the information that you are searching for? If not, please let me know so that I can improve it for you and all our other readers. Just type in the box below.